Geoff Sparrow gives a lesson on energy savings at Mast Landing School in Freeport. 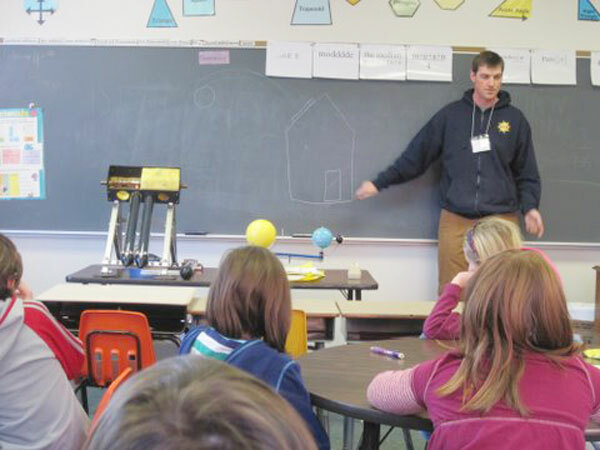 ReVision’s Geoff Sparrow was invited to teach a lesson on solar systems to a third grade class at Mast Landing School in Freeport. To help illustrate how well solar works – even in winter! – we set up a single evacuated solar hot water tube outside with a temperature gauge attached to it. We were able to show the kids the heat generated with the tube in the sunshine… 100+ degrees of heating in less than 20 minutes! We also did an in class activity (see photo, right) that taught the differences between energy saving actions and energy wasting actions. We always love the opportunity to get into classrooms to talk about renewable energy – kids intuitively “get it” and are eager to take an active role in preserving the planet that will be inherited by them. If you’re interested in having someone at ReVision speak at your school or nonprofit, just contact us – we’d love to do it.